Not Verified | Smallest most inconvenient airport I’ve ever been to. Lots of tourism and income for what? No waiting area, and one cafe shop. My child and I have nowhere to sit considering there are only like 5 seats. ✅ Trip Verified | This is one of the smallest and most outdated airports in Europe. For an island which relies on tourism and has a plethora of people come in and out daily I am shocked at how poorly it's been maintained and kept up. The staff is friendly and nice but that's about the only thing good here. Not Verified | I arranged airport assistance for my 80 year old mum and they could not have been more kind. Much appreciated. 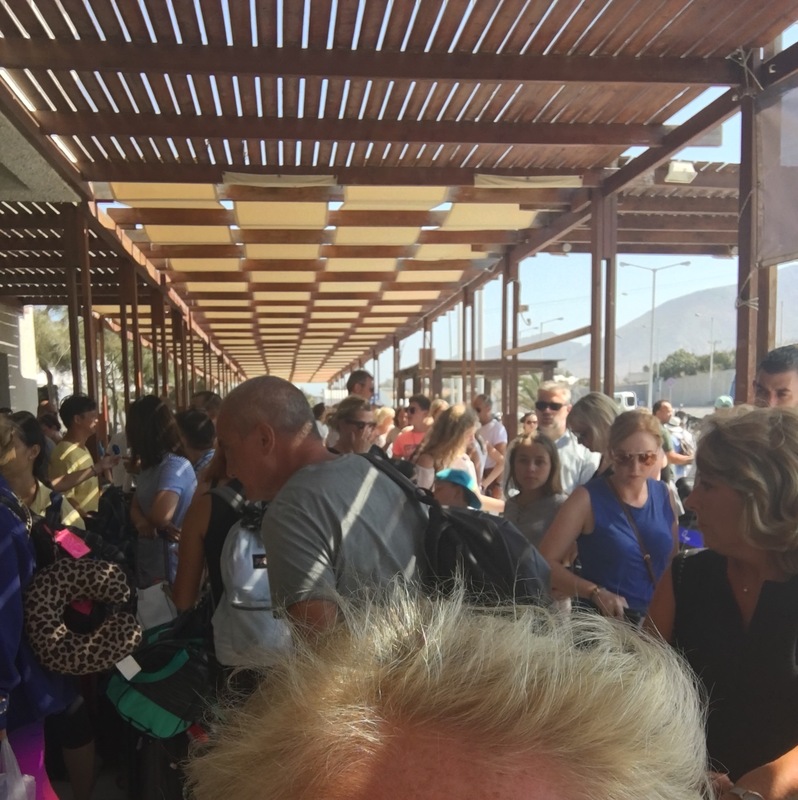 The airport itself was busy but Santorini is so overcrowded with tourists that an overcrowded airport is inevitable. Not Verified | Worst airport I’ve ever been to. Total and utter chaos. Not one airport employee has any sense of urgency. Minimal seating past security. Dirty, stinky. Just an overall terrible experience. If I could give this place a negative 10 out of 10 I would. 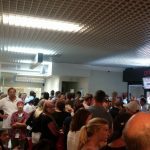 "have never had an issue"
Not Verified | I have been to many island airports, and Santorini Airport rates among the best, in the things that really matter. I have flown in and out of JTR over a dozen times, and I have never had an issue with organization, service, luggage, bathroom, food or cleanliness. It can get a little crowded in peak season when large numbers of package tourists are going through, but any lack of decorum is generally caused by poorly behaved and inconsiderate tourists, and not a lack of organization on the airport's part. From arrival at the terminal to collecting luggage and departing terminal took 5 minutes, which I have always found to be the case. You won't find junk food restaurants, duty free gauntlets with pushy salespeople, or one hour walks to get to your gate as you do in the large high volume airports, and that's a blessing. 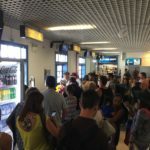 It got a little overcrowded on one occasion when I was departing and a couple of flights had been delayed due to airline mechanical checks, but I have encountered this at Heathrow, LAX, Rome, Dubai, Singapore and most large international airports. 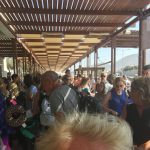 At least in Santorini you can easily step out and enjoy the lovely island air while you're waiting, as opposed to being stuck in an exit lounge in some labyrinthine building. 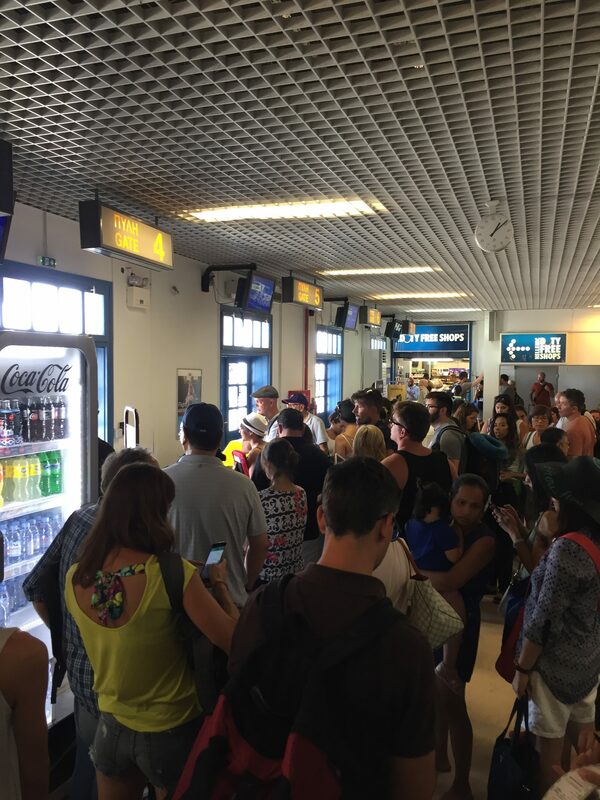 I will point out that small airports are part of the island travel experience, and travelers with unrealistic logistical expectations may consider if a 12 hour ferry boat ride from Piraeus would be more convenient for them. ✅ Trip Verified | Worst airport I've ever been at. Dirty, chaotic, total lack of management, unkind personnel, lines with no sense at all. It's the "best" way to ruin the beauty of an island and the kindness of a people. "we won't be going back to Santorini"
Not Verified | Suffice to say we won't be going back to Santorini. Totally spoilt our lovely time there. Herded like cattle. Cramped space and queues overlapping. A high security risk and I do not understand how the airport authorities allow thousands of travellers in such a small space. No signs to indicate where to go or what to do. A total disaster and shame on you Santorini for allowing such diabolical customer service. People sitting on stairwells whilst at the same time people were queueing right up the stairs - no way could you pass. Oh I could go on and on and on. One very unhappy customer! And to add to my anger only 1 ladies toilet in use - queues out the door - no toilet paper! ✅ Trip Verified | Chaos, Chaos, Chaos. 1 person on Passport control, arrival and departure 1 hour minimum to pass through 45 minute wait for bags to arrive on arrival - after 1 hour wait at Passport control! Huge queues on departure. Airport way too small to handle so many flights. Duty free the smallest you will ever see. Airport departure lounge over filled with every departure. 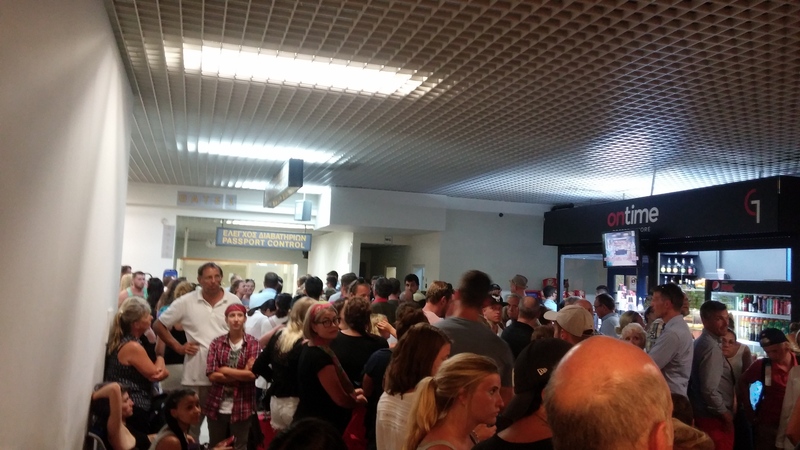 This one aspect, the airport, will ensure that we never visit Santorini again - they appear not to want our Euros. "the worst airport I've been in"
✅ Trip Verified | Easily the worst airport I've been in. They allow hundreds of people through to the gates but the space is minimal. There is literally no oxygen in the place. It can't facilitate the thousands of tourists passing through with space for 2 customs/passport control officers and 3 runways Lots of planes delayed so passenger numbers swell whilst everyone waits for announcements. The air canteen was the only good thing about the airport. Not Verified | Friendly staff everywhere directed our family of five all the way through the too small airport. Well organized. They made sure there were no serious bottlenecks anywhere. We have experienced much worse in large airports, also in the US. Got seats at a table upstairs, outside, but in the shade with fans in the ceiling. Good food, no stress.